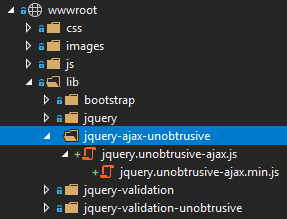 First, what is Unobtrusive AJAX? Well, it has been around for almost 10 years, and was first introduced in ASP.NET MVC 3.0 along with the introduction of the Razor View engine. WebMatrix and the Web Pages framework came out at the same time, but Unobtrusive AJAX has outlasted both of those initiatives. Since then, the library has been added to GitHub, where is forms part of ASPNET Core. The idea behind Unobtrusive AJAX is that AJAX behaviour is attached to form and anchor elements via HTML5 data-* attributes, instead of binding click event handlers in script blocks. In old MVC, these attributes can be generated from Html helpers: Ajax.BeginForm and Ajax.ActionLink and then setting some AjaxOptions. 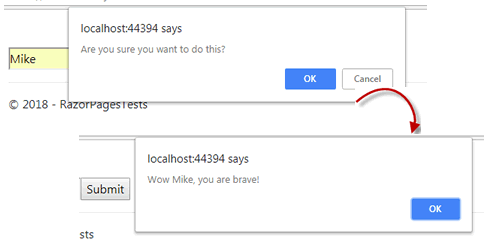 These particular helpers are not available in ASP.NET Core, but you can add the custom attributes directly to tag helpers instead. If you plan to make use of this library on multiple pages, the Layout page is a better location for referencing it. Either way, now you are ready to roll. data-ajax-mode Gets or sets the mode that specifies how to insert the response into the target DOM element. And that is all it takes. When the form is submitted, the request will be initiated by AJAX. There is no action specified, so the form values will be posted to the URL of the page where they can be processed in an OnPost handler. Note that the form's method attribute is also specified as post, along with the custom attribute. In the absence of an action attribute being supplied this is necessary to ensure that the request verification token hidden field is generated and included in the form. Without this, form posts will result in a 400 Bad Request status code because they will fail the request verification test. The data-ajax-url attribute is used to specify the URL for the AJAX request. The data-ajax-update attribute takes a jQuery selector representing the element that should have its content replaced with the response. This has been quick look at how useful the Unobtrusive AJAX library can be in an ASP.NET Core Razor Pages application. It targets the anchor and form elements, and will reduce the boilerplate code that you write to perform many common AJAX-related tasks. It is a very small library - only 4kb when minimised. It is dependent on jQuery, so if you are already using that (e.g. as part of Bootstrap), the additional overhead is tiny. You can see more examples of using Unobtrusive AJAX in Razor Pages here.